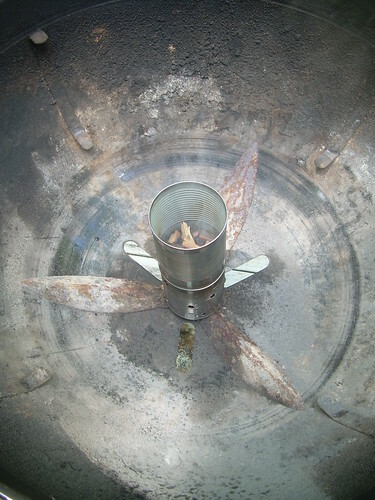 One requirement for cold smoking is a constant source of low heat to smolder wood. This is most commonly achieved using a hot plate and pan with wood chips in it. But, it's energy intensive and requires an outlet outside for the duration of smoking. I wondered if a kerosene tealight (or paraffin) would do the trick. This could be placed inside a can (with ventilation holes) and on top of that can, wood chips in another can. I tried this using a citronella/kerosene tealight (I wouldn't use this in the future because of the citronella, but for proof of principle). The piggy-backed cans were placed inside my funky Weber-Kettle mod and voila! Within minutes, it was filled with mesquite smoke. And barely any heat generated. Since these little tealights can go for 12-18 hours, it should be a convenient source of fuel. The big question, which will have to be tested on a piece of real food is: Does the food acquire any flavor from the burning kerosene? I suspect, since the kerosene is well contained in these tealights and if the combustion of it in the wick is complete, all the flavor should come from the choice of wood used for smoldering. oooooooo - if this works - do I have plans!!!! The bottom can eventually got so hot, it melted the citonella-containing container and melted. So, it eventually failed but the key, for me, was the simple flame was hot enough to smolder and not burn the wood chips. Just have to modify the bottom container to accomodate a kerosene/paraffin burning liquid candle. Keep you posted.